Following last week’s public leak of Windows 8.1 Update 1, a newer build has made its way online, revealing even more desktop friendly tweaks in what’s reportedly a near final version of the code. First and foremost, it's been confirmed that this latest build boots to the desktop on non-touchscreen PCs by default, while tablets like the Surface 2 bring up the Start screen by default. The ability to boot to desktop already exists as an opt-in setting since Windows 8.1, released in January. The change makes sense, though, leaving the touch-optimized interface as default only for actual touch devices. Elsewhere Microsoft is adding title bars with minimize, close and snap buttons to Modern UI (aka Metro) apps, but they’ll only pop up for a second after launch so you know they are there. You’ll also be able to bring up the Windows taskbar from Metro apps by hovering your mouse along the bottom of the screen, and the taskbar will be customizable with both desktop and Metro apps so you can switch between them or access window previews. You can even activate the taskbar when you’re on the Start Screen by dragging the cursor down to the bottom. The changes are clearly meant to optimize mouse and keyboard performance as most will only be apparent, or enabled by default, on PCs. 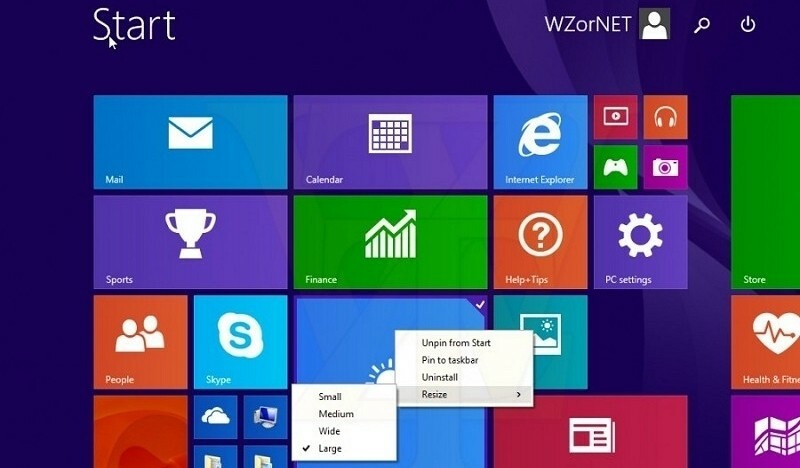 As reported earlier, similar improvements are made to the Start Screen, where right-clicking on Live Tiles now produces a context menu with options to resize, unpin, and more, while search and shutdown buttons have been added right onto the Start screen to let users more easily find those options. Microsoft is also making the default program for pictures and audio files relevant to the device they are being opened on. Whereas it used to be that these files were associated with the Metro-style Photo and Music apps (a big annoyance), pictures and audio files now open by default in the Windows Photo Viewer or Windows Media Player whenever they are opened using a non-touchscreen desktop PC. Lastly, SkyDrive has been rebranded to OneDrive across the OS, and there’s a new “disk space” option under settings that breaks down individual app sizes as well as file sizes for media such as pictures, videos, and music so it’s easier to get an overview of your biggest storage hogs and clear up some disk space. According to ZDNet’s Mary Jo Foley and her sources, Microsoft's ship target for Windows 8.1 Update 1 has shifted from March to April 2014. The current plan is to use Patch Tuesday to distribute the coming so-called "Spring" update via Windows Update, so her best guess is that release day will be April 8.